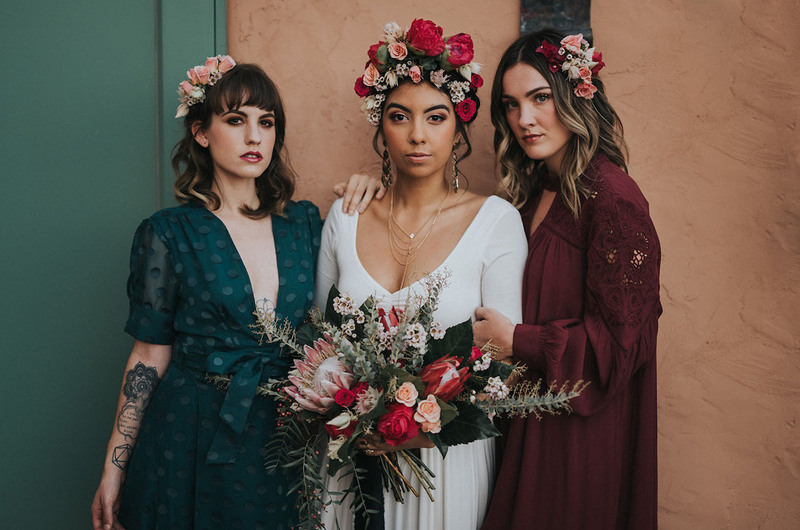 While many people are familiar with Frida Kahlo as being the fiery, flower crown wearing artist… She was SO much more. She was a lady of wit, of beauty, of immense creativity, + dedication to her people, and her craft. Frida + her husband, Diego Rivera, had a passionate + turbulent relationship — much of it documented through their art, and they frequently hosted friends in their home. 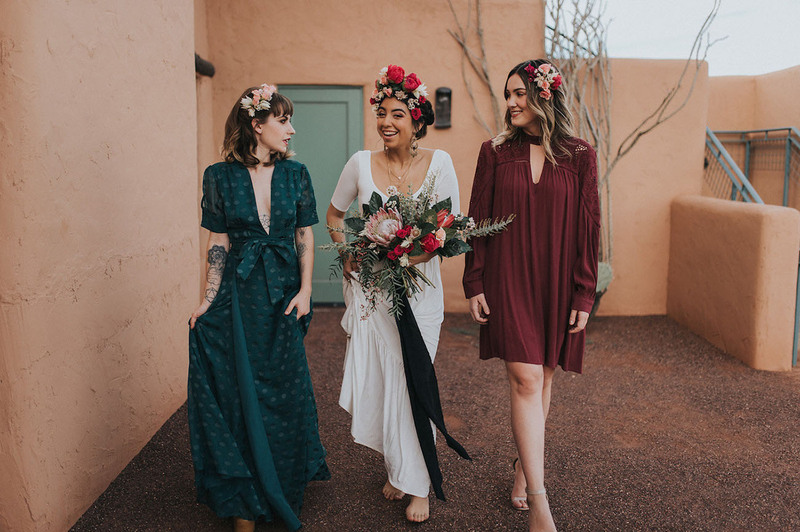 Inspired by their relationship, the subdued colors of the desert, and Frida’s love of florals, Noir Floral gathered a team of talented vendors to bring that passion alive at Eisendrath House in Tempe, Arizona. 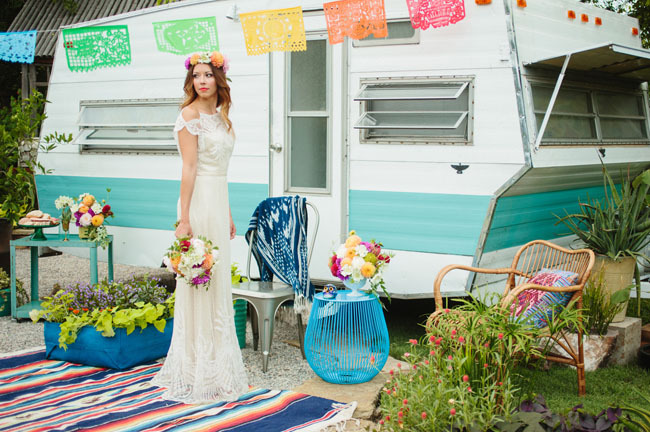 She shares This shoot pulled the vibrant colors and patterns found in Frida’s art and focused on her wild personal life with her husband. I loved the idea of this intense, passionate love against the backdrop of a city that the couple loved and was rooted in. 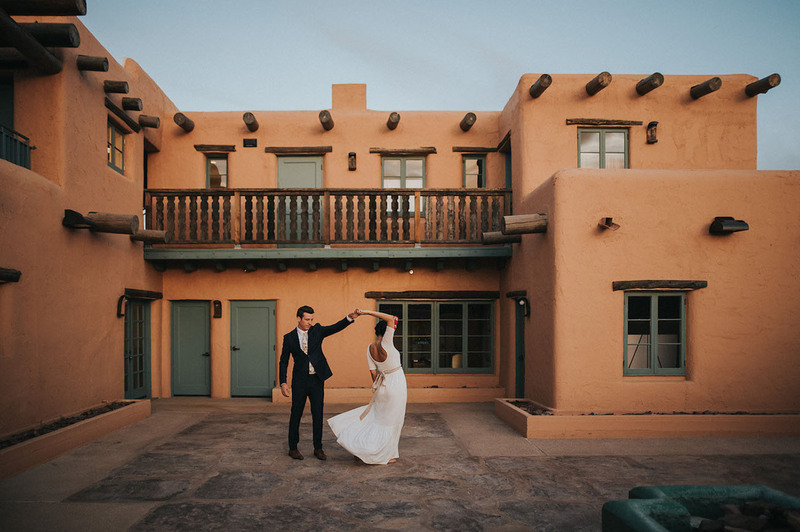 Ready to be transfixed by photos captured by Jonnie and Garrett? Let’s take a look! 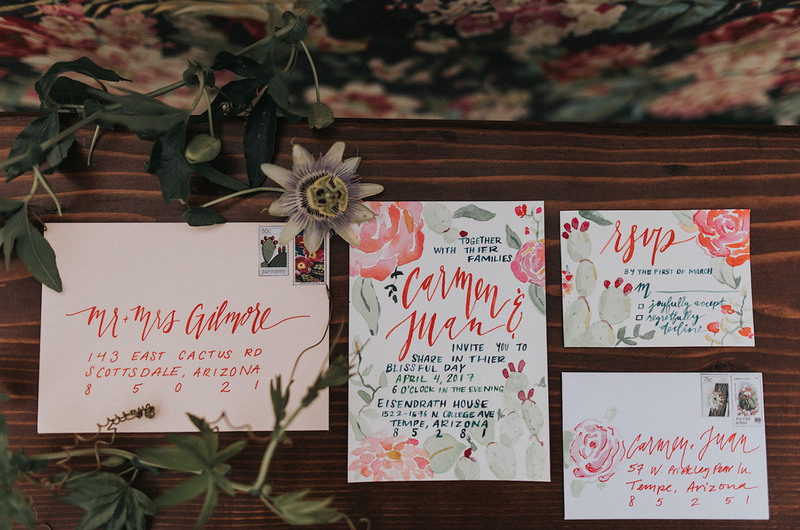 Floral-filled and brimming with watercolor succulents, this vibrant invitation suite was crafted by They Call Me Spindles. 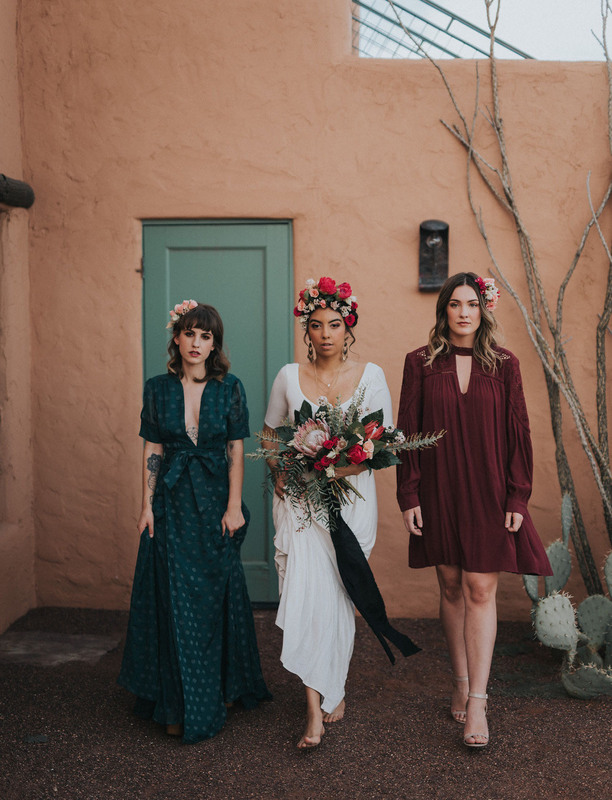 Deep teal + burgundy for the ‘maids dresses from Vida Moulin rounded out the moodier feel of this styled shoot… And we LOVE it! It wasn’t just the ladies who were stylin’… But look at these dapper gents! 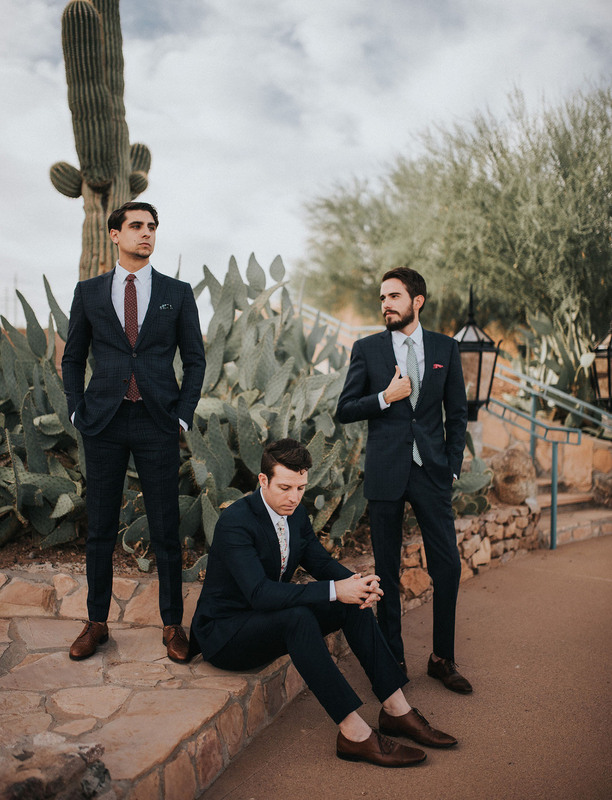 Their suits came from Magro Clothing. And did you check out their mismatched ties?! SO fun!! “Take a lover who looks at you like maybe you are magic.” Yes, yes, yes. 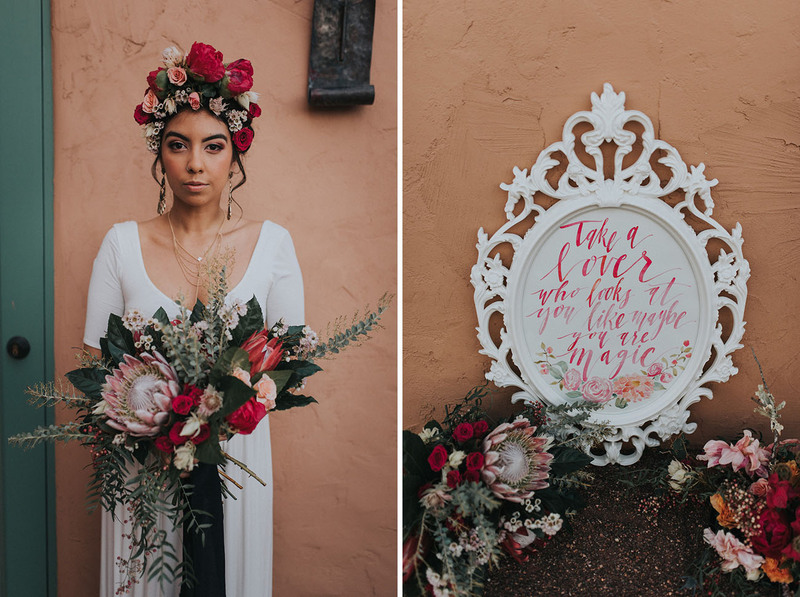 This darling calligraphy piece was hand-lettered by They Call Me Spindles and the quote is from a poem called “Frida Kahlo to Marty McConnell” by Marty McConnell. 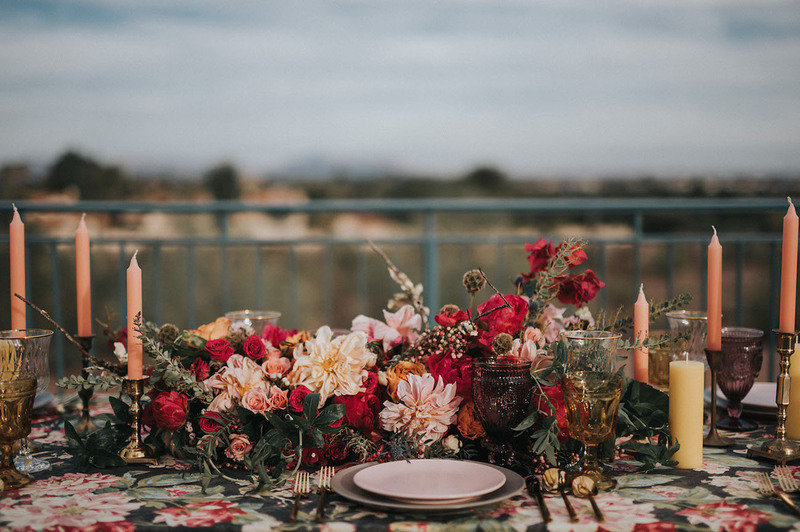 Never enough florals!! 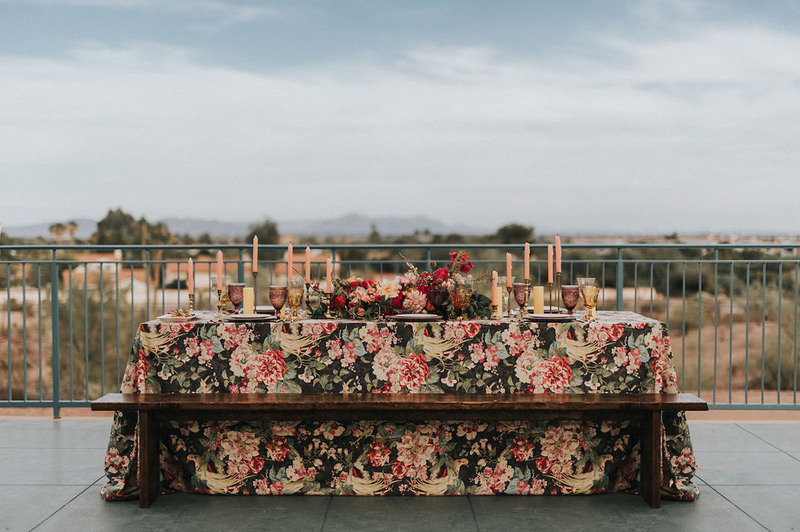 We’re majorly crushing on the use of this floral-filled tablecloth from La Tavola Fine Linens. 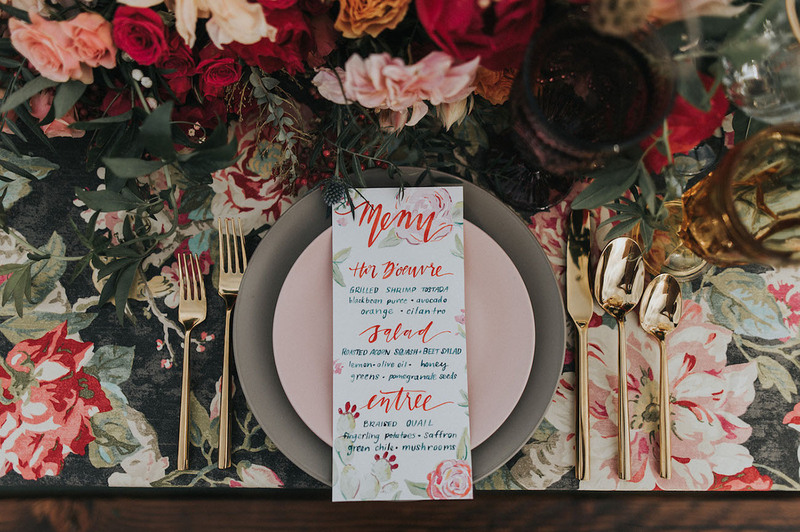 And the use of gray, blush, + gold tones in the pieces from Tremaine Ranch? Genius. 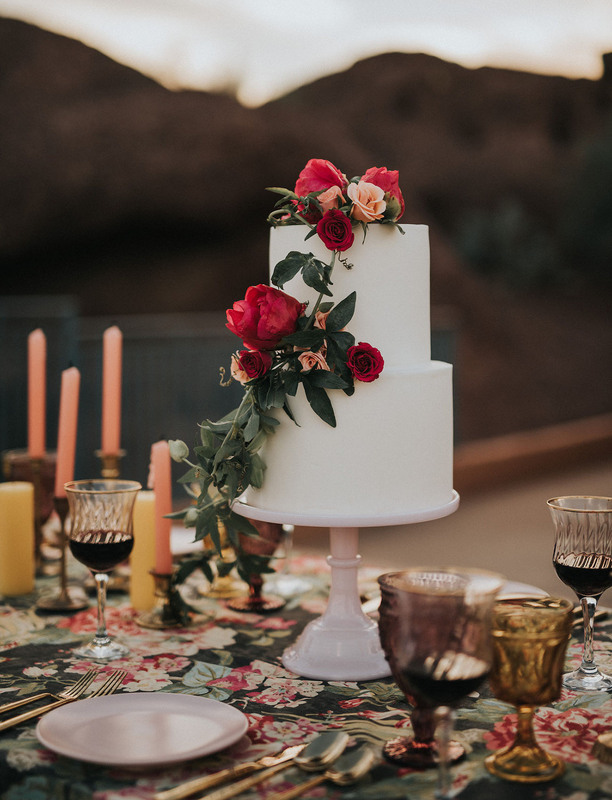 Simplicity at its finest — we adore this two-tiered cake by Ruze Cake House. 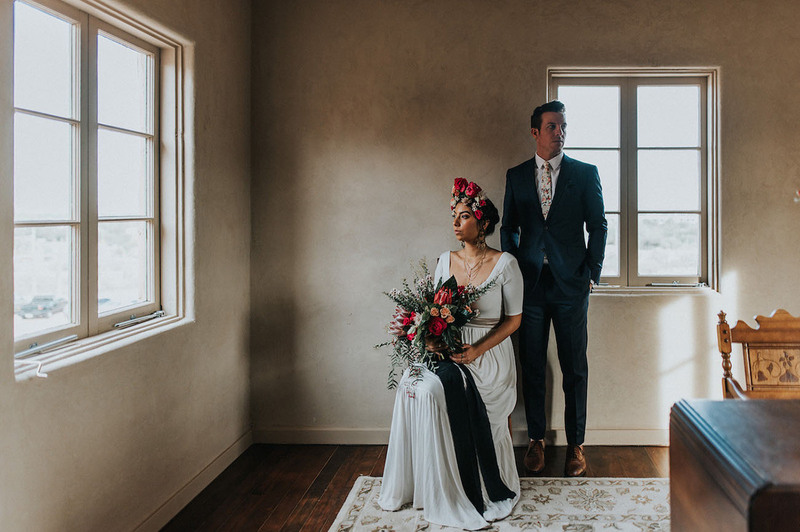 The bride donned a simple + elegant dress from Cleo and Clementine. 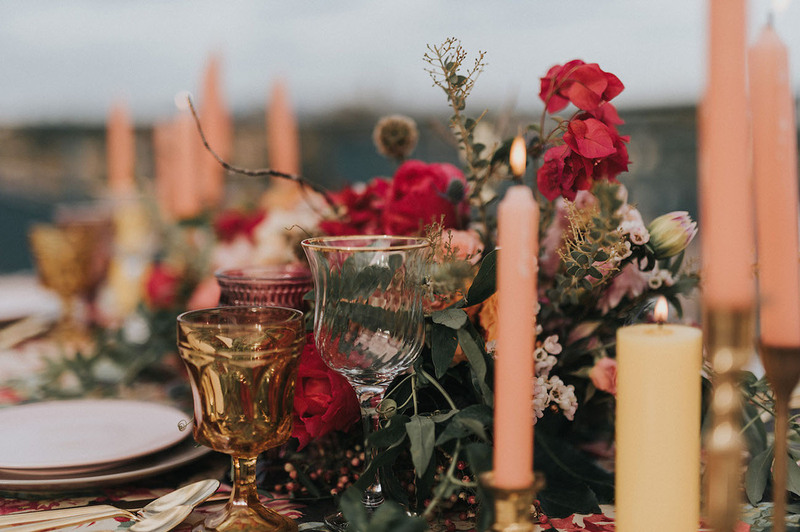 When paired with all the florals, we think it’s a winning combo! 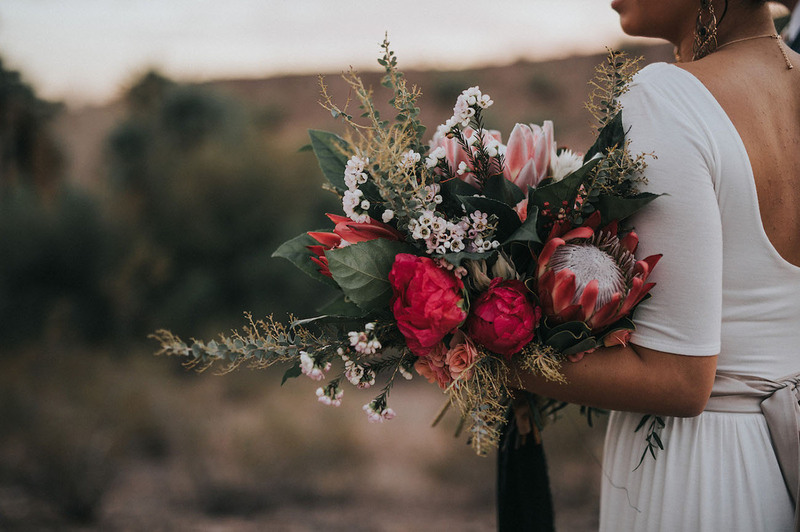 We can never get enough of protea-filled bouquets… Especially this one by Noir Floral! 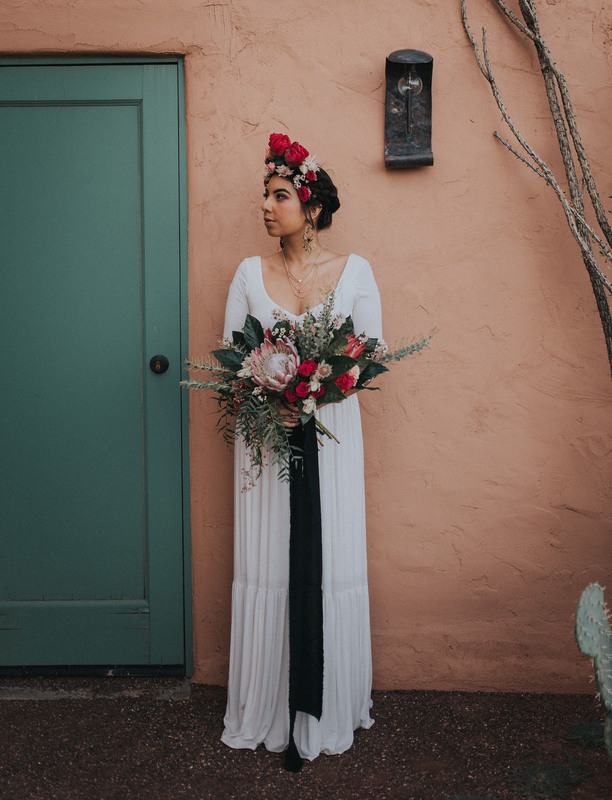 What a beautiful way to capture the essence of Frida Kahlo, her love of florals, and the desert, right? Thank you so much for sharing. 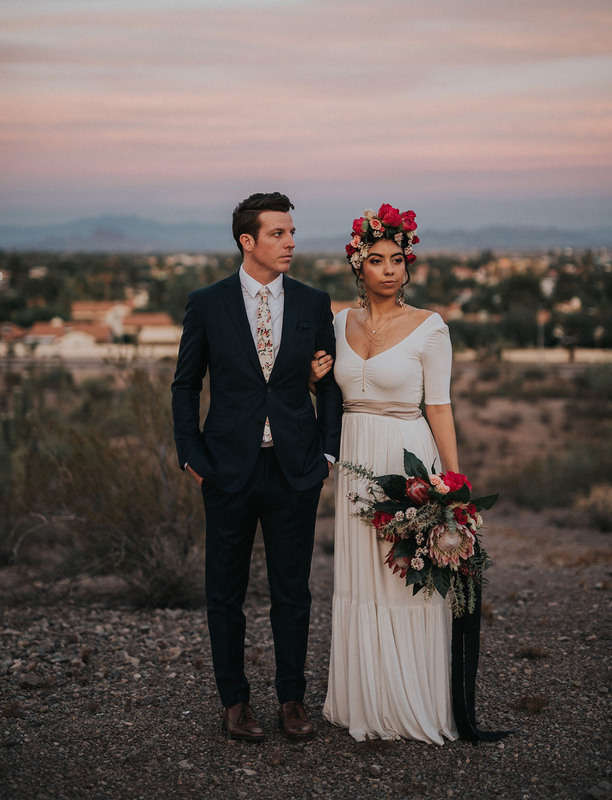 This shoot was one of our favorites and the images are absolutely stunning. 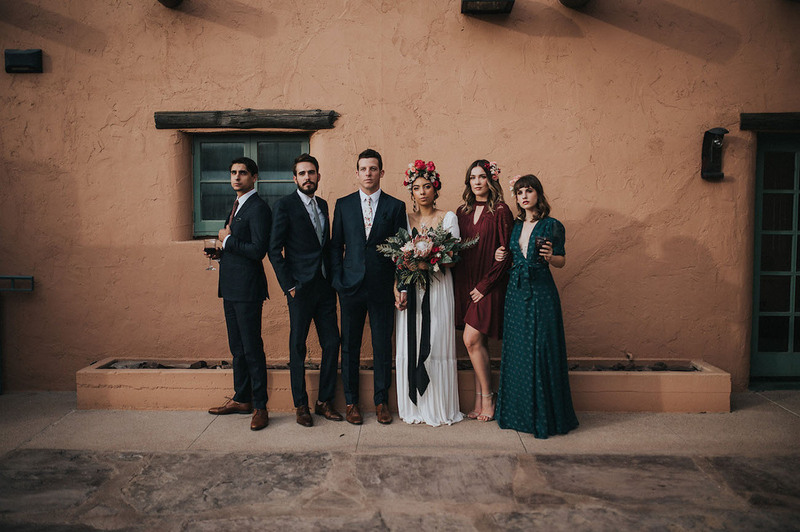 Thrilled to see if being shared on GWS! The floral crown is so beautiful! “Take a lover who looks at you like maybe you’re magic” is NOT a Frida Kahlo quote. It’s actually from a modern day Chicago based poet by the name of Marty McConnell who used Kahlo’s name in the title. It’s all over the internet as a Kahlo quote unfortunately for McConnell, because she’s a brilliant poet and deserves to be credited. Unfortunately no one does their due diligence anymore and we all take what’s on the internet as truth. Hasn’t anyone ever wondered why we never heard of this amazing quote until just the last few years? ?